If you have the whole idea of black coffee, you can add coffee creamers to make your coffee smooth, tasty and creamier. There are different types of coffee creamers flavors on the market but choosing the healthy from the unhealthy ones becomes a problem. How do ensure that you buy the best yummy coffee creamer that is gluten and lactose-free? I have spent quite some time on research and hereby present to you quality coffee creamers you can try. They are tasty, creamy and sweet. It comes with a pack of 180 original flavor liquid coffee creamers. Nestle Liquid Singles Coffee Creamer is rich, smooth and delicious. Whether you are mixing it with a hot or cold beverage, all you need to do is stir and you get that rich, smooth and consistent texture. The creamer is great even for those who are watching weight as it is cholesterol-free. For those with lactose intolerance, no need to worry as they are lactose-free. Each little cup contains about 15 calories. The little cups are great to keep you from overusing. The creamer retains flavor and quality even at room temperature for as long as 9 months so you do not need to refrigerate. Land O Lakes Mini Moos Creamer is a product of Medline. The package comes with 192 little cream cups. These little cups are convenient and will keep you from over-using. They also make storage easy. The creamer has 1g fat, o.5 g saturated fat and each little cup weighs 9ml. You do not have to refrigerate them and they still last a long time. Because of this, you can use them even at work or when traveling. Each little cup has 10 calories which should help enjoy creamer with your coffee even if you are watching your weight. The creamer adds great taste and smoothness to your coffee thanks to the mini moo's half and half flavor. The flavor is balanced and does not mask the taste of coffee. In packs of 12, this tasty powder coffee creamer blends well and fast with both hot and cold beverages. It gives a smooth, velvety and consistent original flavor and texture. The creamer comes in compact, beautiful and easy to carry around canisters. Their small sizes make them very convenient for storage, usage, and transportation. They have flip tops that make it easy, fast and hygienic to pour out the cream. The creamer is cholesterol, gluten, and lactose-free so it can be used by people with those dietary restrictions. The shelf life is up to 2 years and the price is really good. This is a powdered creamer that just compliments the taste of your coffee. 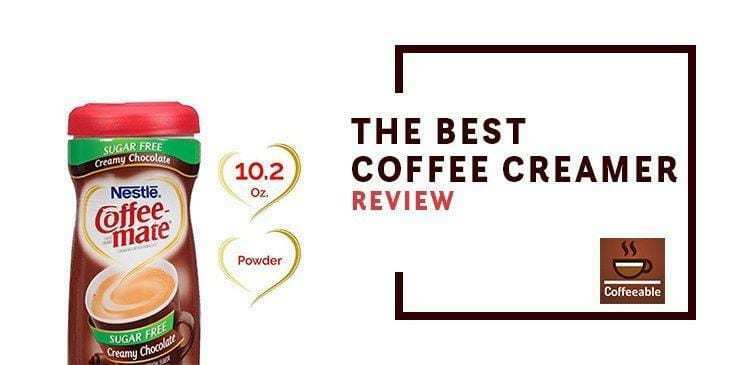 Unlike those creamers that end up completely overtaking the coffee taste, this one just makes it creamier and sweeter while still keeping the coffee flavor. It is also great for tea if you like creamer in your tea. The canister size is really value-friendly. They are just big enough and are designed to make it easy to pour out the cream. They are also shelf stable so you can store them for a while. With only 10 calories, the creamer is great for weight watchers. This is a 2 pack of great tasting powder coffee creamer with a sweet, original flavor. The creamer comes in up to 19 great flavors. It is fat free, non-dairy, gluten-free, non-GMO and has sugar free options. It gives a creamy and smooth flavor and that thick texture to your coffee. The canisters they come in are big and able to last you long. Each canister holds about 500 servings. The canisters are recyclable and they have a lid that makes pouring fast and easy. The cream can last long even if it is not refrigerated. You just need to store it well. This is an assortment of 6 flavors all in 30 packs. The liquid coffee creamer is great if you are looking for variety. There are French vanilla, vanilla caramel, Irish crème, cinnamon vanilla crème, hazelnut and original flavors. The little packs help you get a good serving. The variety of flavor is the most amazing thing about this creamer. You get to discover new sensations and flavors with every different flavor. Despite this assortment, the price is really good. All the flavors are really great and will give you the creamy, tasty addition to your beverage. You do not have to buy the whole pack with flavors that you do not like. You can buy just the flavors you prefer. The shelf life is about 6 months and the creamer does not need to be refrigerated. This is a product of International Delight. The creamer is in 192 small and convenient shelf-stable packs. Each pack is just enough for a single serving. It contains smooth, rich and creamy vanilla flavor that will just make your coffee taste great. The creamer has both milk and cream. It mixes really well with both hot and a cold beverage. You do not need to refrigerate the creamer. Since the packs are for single serving, there is no risk of spoiling. This makes it really convenient for traveling or use in the office. Each pack contains 1g fat, 0.5g saturated fat and 0 on the other ingredients. A single pack is 9ml. Nestle Coffee-mate creamer sugar-free creamy chocolate is great for that chocolate, creamy and rich taste especially for people who can't or won't have sugar. It is non-dairy and free of lactose but it has a milk derivative. You can use it to make a mocha. The creamer is really strong. Just a little bit of it and your coffee tastes great. This makes it able to last long. You do not even have to refrigerate it. The chocolate smells great and leaves no aftertaste. Nestle coffee- mate coffee creamer is a product of Coffee-mate. Coffee-mate prides itself on producing some of the best coffee creamers available. This powdered creamer offers you a natural, deliciously creamy and rich taste. All these come in a single large canister of 56oz. this saves you from having to go to the store every now and then to get creamer for your coffee. The creamer is dairy free, lactose-free, non-dairy, gluten free and cholesterol free. The quality control is great. There is no harmful bleach or coloration. Made by Green Grass Foods Inc., Nutpods is a dairy-free combination of almonds and coconuts. The creamer is completely unsweetened so it is recommendable for people with diabetes. It also allows you to sweeten your own beverage according to your preference. You can also use it as a non-dairy alternative when preparing mashed potatoes, a sweet dessert or whatever else you dim fit. The creamer is smooth and rich. It is GMO and Carrageenan free. Before opening, the product can be refrigerated or just stored at room temperature. After opening, it has to be refrigerated but it should not be frozen. This creamer is supported by the Vegan Society, the Gluten Intolerance Group, the Non-GMO project and Orthodox Union. It has a really strong and distinctive taste but comes in different flavors. This creamer is named after Laird Hamilton, a great big wave surfer. It is gluten, vegan and dairy free and has no additives. Laird superfood coffee creamer is made from real coconut milk powder and Aquamin, which is a marine algae. This combination gives an exotic, natural flavor and smell. The texture is smooth, rich and luscious. It has a little sweetener for improved taste. It does not have to be refrigerated and lasts up to about 90 days after opening. Though it may clump when you first open it, all you need to do is mix it up a little using a spoon or massage it. It will mix perfectly with your hot beverage. Coffee-Mate Coffee Creamer is so sweet, smooth and creamy laced with a delicious French vanilla flavor. It is non-dairy and lactose-free. It, however, contains a milk derivative. It comes in a pack of 6. The creamer can be stored at either room temperature or refrigerated before opening. When it is opened, it has to be refrigerated. It is also great for use within 2 weeks. You should not freeze it. The packs are really shelf stable so easy to store. Since it is liquid, you don't have to worry about spending all that time heating water to dissolve it into. It has a nice consistency and blends really well with your beverage. This is a non-dairy, powdered coffee creamer. It is smooth, creamy and rich.it comes in 8 or 16oz. single pack canisters. These canisters are big so you don't have to worry about running out of creamer too often. This creamer gives your coffee a nice white look, great taste and leaves no aftertaste. It blends perfectly with your coffee even if it is not so hot. This flavor does not overpower your coffee. Its own taste is subtle enough that you still get the coffee flavor. It does not need to be refrigerated. The containers are disposable and have sugar in them for sweetening. They are also easy to open and pour out the creamer. The flavor is one of the most important considerations when choosing a creamer. There are a lot of good flavors but it all depends on your personal preference. Some of them come in packs of assorted flavors. If you are not really sure about what you or the people you are buying for prefer, these are the best. A good creamer should not have an odd aftertaste. It should also compliment the taste of your beverage but not mask it. There are a lot of gluten free and dairy free creamers. If you are allergic to anything, check that it is not contained in the creamer. Note that many creamers that are labeled dairy-free are not completely dairy-free. The little percentage of casein they contain is still an allergen. If you are vegan, the case is them. You need to carefully study the ingredients before settling for a creamer. Some creamers will come in very big packs and have ridiculously short shelf lives. You will just end up wasting your money as you will be forced to discard your creamer after a short period. If you are going for a creamer with a short shelf life, buy just enough to last you the said period. As much as you want the best coffee creamer weight loss, you don't have to spend a fortune to get it. The most expensive is not necessarily the best. After you have considered all that you want your creamer to be for you, go for the best bargain. That, of course, does not mean that you should go for the cheapest. Just make sure that the cost matches the quality. Choose a liquid creamer brand that blends well with your beverage to give a consistent and smooth texture. Most creamers will blend just fine with a hot beverage. If, however, you prefer cold drinks, then find a creamer that won't clump up in your drink. While some people prefer their coffee black, a good number uses creamers of different types. The best yummy coffee creamer is the one that best meets your preferences. We recommend the mentioned coffee creamers as they all have unique properties that make them special. Read the review and evaluate the different creamers available. It will help you make an informed choice of the best coffee creamer.